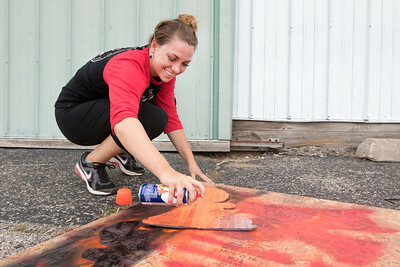 Sarah Nader- snader@shawmedia.com Annie Kamps, 17, of Woodstock spray paints some decoration while working on the senior class homecoming float Monday, September 28, 2015 in preparation for the Woodstock High School homecoming parade this Friday. Other preparation activities include decoration the gym and wind decoration on the Woodstock Square. Sarah Nader- snader@shawmedia.com Susie Andrade, 16, of Woodstock works on the junior class homecoming float Monday, September 28, 2015 in preparation for the Woodstock High School homecoming parade this Friday. Other preparation activities include decoration the gym and wind decoration on the Woodstock Square. Sarah Nader- snader@shawmedia.com Evan Geske, 14, of Woodstock works on the freshmen class homecoming float Monday, September 28, 2015 in preparation for the Woodstock High School homecoming parade this Friday. Other preparation activities include decoration the gym and wind decoration on the Woodstock Square. 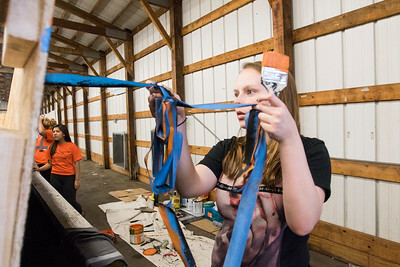 Sarah Nader- snader@shawmedia.com Jessica Pape, 16, of Woodstock works on the junior class homecoming float Monday, September 28, 2015 in preparation for the Woodstock High School homecoming parade this Friday. Other preparation activities include decoration the gym and wind decoration on the Woodstock Square. Sarah Nader- snader@shawmedia.com Max Lynn (left), 18, of Woodstock and Eric Bojs, 18, of Woodstock Monday, September 28, 2015 in preparation for the Woodstock High School homecoming parade this Friday. Other preparation activities include decoration the gym and wind decoration on the Woodstock Square. 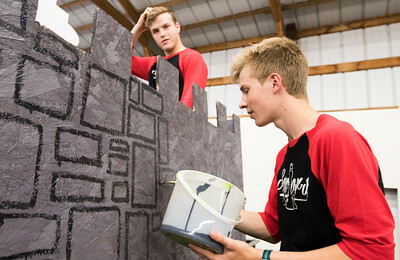 Evan Geske, 14, of Woodstock works on the freshmen class homecoming float Monday, September 28, 2015 in preparation for the Woodstock High School homecoming parade this Friday. Other preparation activities include decoration the gym and wind decoration on the Woodstock Square.